Fellow r3Vers, I picked up an '89 325i auto this fall and I love it...but the auto transmission has got to go! 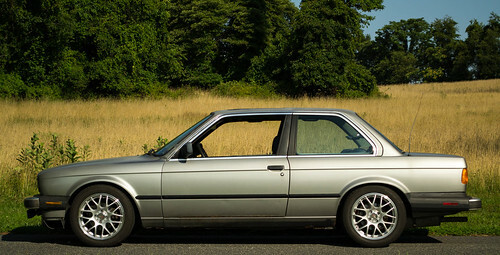 I'm looking for a referral for a shop that has done E30 5 speed swaps before and does them well. I'm in the Washington, DC area, but I'll travel a couple hours away for the right shop. I thought about posting this in the mid-atlantic forum, but it's pretty quiet over there. I'm sure there are nearby shops that can do it but it may be worth a call to Bimmerbuddies in PA just passed Harrisburg. Good people that might even have a swap on hand. Thanks, I'll check 'em out! Open to other suggestions if anyone else has any recommendations. Try looking at "EuroWerks". They are in Falls Church off rt. 29. I used to take my mom's VW there for regular service and they do good work. I would always see E30s and other German classics parked in their lot. They do good work, may be worth checking out. I've also seen some recommendations from many years ago for Zimmerman Automotive in Gaithersburg, MD and Alexandria Bavarian in VA. Both are still around. If anyone's had them do a transmission swap, please let me know how that went. Blue Ridge Sports Cars in Baltimore hooked me up when I bought my Touring. They fit me in for semi-major maintenance so I could drive the car back to Charlotte. They know Bimmers, the price was reasonable and the owner personally stayed late to get me on the road after finding some unexpected problems with the car. I've used BRSC as well with good results. Total "dive" shop, I love it. Had a couple of E30s, a 2002, E36s, couple of Jags, and a boring X3 (mine) in there when I was there. Reminds me of Touring Cars back in CLT, really miss beer nights out there, but it sounds like Dan isn't doing so well (off topic). I had my swap done by Zimmerman. They did a good job and i had no problems. I’m sure he’s done many of them. I brought all my own parts, and he did the whole swap including the diff.